We sincerely hope everyone had a wonderful Thanksgiving as we all have so much to be thankful for, even if times seem tough for many across SW Florida. For those eager shoppers we hope Black Friday was a day to score wonderful bargains. We were trying to come up with a name for the day after Black Friday this year and we decided on Grey Saturday, because official sales numbers were released for the Florida real estate and market and SW Florida scored mixed results, earning it the Grey Area status. Last month we reported a change in direction in listing inventory and said we wanted to keep an eye on those numbers going forward. 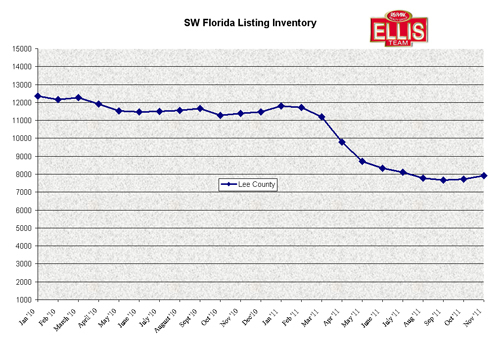 For the 2nd straight month, listing inventory rose. The numbers aren’t staggering as we’re talking about a difference of 231 homes, but it is a recent trend nonetheless. Single family home prices were up 15% over last year, but they are down 7.69% from last month. We are in a volatile market because agents can’t count on which closings will actually close in a given month. Transactions are becoming trickier to count on as governmental regulations are holding up closings, causing delays, and wreaking havoc on the market. It’s not uncommon for buyers to receive approval on their short sale and then walk from the deal because of the length of time, or because they became impatient and went for another deal more likely to close. Banks have told us the foreclosure backlog was coming and we are starting to see more assignments in the 4th quarter. Another large bank has told us to watch out for 1st quarter 2012 for even more. These bank foreclosures may be just what the doctor ordered for our market though because in certain submarkets there is a feeding frenzy to buy. We have short sales, and some traditional sales of which not all are priced at market value, which is typical in any market, up, down, or sideways. We’ve had a lack of foreclosure properties as banks were stymied with the legal debacle of the robo-signing issue that caused them to go back and evaluate if they had legal standing to foreclose and the paperwork to prove it. We’re starting to see rising inventory and it’s not because of foreclosures. We are entering season which is a time when properties are gobbled up like a Thanksgiving turkey, so we’d expect to see inventory decline in the next few months even if the banks do release more foreclosure inventory. SW Florida’s appetite when it comes to a bargain is insatiable, much like a Black Friday sale. Last month we had Trick or Treat Day, so we’d like to see a solid direction in the market. 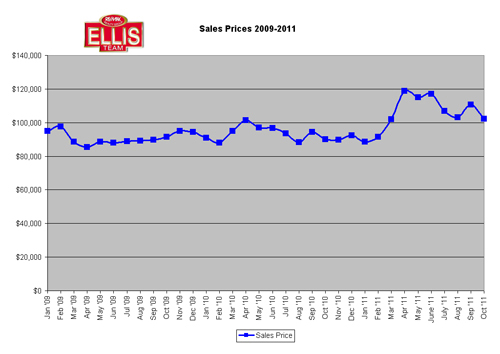 The past few months have brought ups and downs in median prices. Combining the recent up and down price swings, rising inventory, predicted rising foreclosure activity, and tempering that with the upcoming season means we have a market to keep our eyes on. Posted in Southwest Florida Real Estate.Tagged Cape Coral real estate, Ellis Team RE/MAX Realty Group Fort Myers Florida, Florida real estate, Fort Myers real estate prices.